The holiday farm Fattoria di Paltratico is located among the beautiful hills of the town of Rosignano Marittimo. At a first glance, the scenery is marvelous: the soft multicolored hills, the tree-lined roads and the green woods are all elements of a landscape still intact after centuries, as the evidence of a respectful cohabitation between man and nature. Numerous paths that allow you to discover all the richness of this part of Tuscany still little known but full of beautiful landscapes cross all territory around the farm. Numerous are the sites of historical interest to testify the presence of the man starting from the Etruscans until the remains of the most recent rural tradition, such as the so many water mills along the streams, the abandoned mines, the wash-houses where women washed their clothes till the 1960s. Even the naturalistic aspects deserve attention. Our countryside is indeed rich in life and colors and it is not rare to run into foxes and squirrels, while many other species find shelter in the scrub, such as badgers, porcupines, wild boars and many others. In Spring, the sky is filled up with numerous species of birds, from the swallows to the colorful bee-eaters while several birds of prey like buzzards and hawks are never lacking. In Summer, the nights are marked by the calls of the nocturnal birds of prey like the owl and the scops owl. Before leaving to discover this area, we suggest you visit the website of the Parco Culturale di Camaiano where all necessary information is available, so as not to miss anything! The sea is a 20-minute drive away and offers several options, from wild cliffs just outside Livorno, for a real immersion in nature, to the white beaches in Cecina, that continue for kilometers lined by pine groves, up to Baratti with its wonderful gulf. You will find free or private baths, for the more sportive or the demanding ones, with restaurants and spa. There are also beaches with access to the dogs. Numerous activities related to the sea: surfing, kite surfing, diving, trips to nearby islands (the port of Livorno is only 30 minutes by car) and many others. Just a few kilometers away are the villages of Gabbro, Castelnuovo della Misericordia and Nibbiaia, rich in charm and history with their narrow streets and their picturesque views; here you will also find basic shops, bars and restaurants. Rosignano Marittimo, with its beautiful medieval castle is only ten minutes from Scaforno. 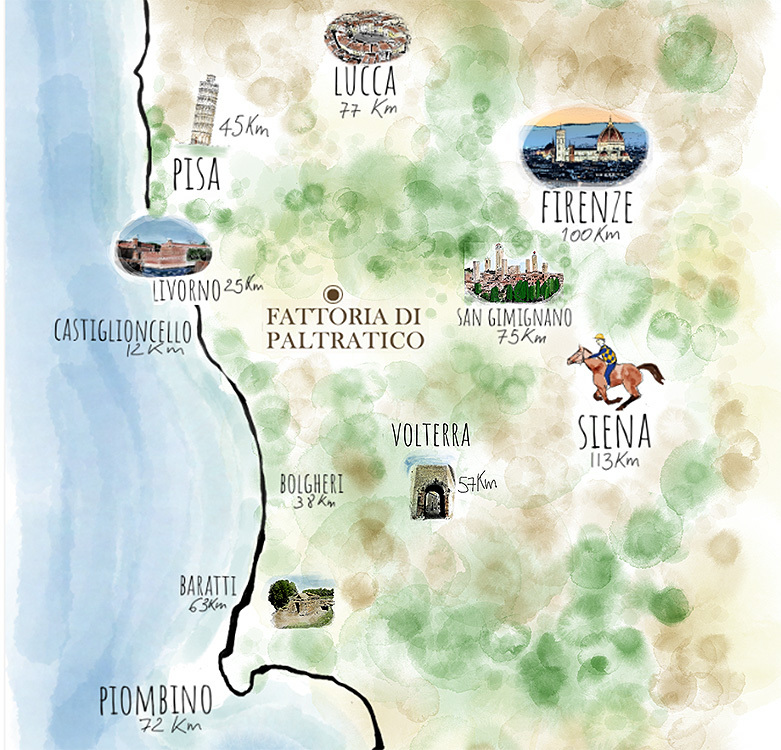 Other towns like Bolgheri, Campiglia, San Gimignano, Volterra, are easily reachable by car. Even cities of art are easily accessible by car or train. Livorno, Pisa, Lucca, San Gimignano are the nearest (20-60 minutes by car). Florence is an hour and a half’s drive away.